Miami Law’s Health Rights Clinic was invited to present last week at Jackson Memorials’ “Grand Rounds” – the established important teaching tool and ritual of medical education and inpatient care in which the medical problems and treatment of a particular patient are presented to an audience of doctors, residents and medical students. During last week’s Grand Rounds with medical students and resident physicians from the Miller School of Medicine, members of our Health Rights Clinic brief them on legal options available to their patients to address concerns that impact their health and wellbeing. Grand Rounds is usually reserved for doctors to present a particularly vexing medical case for discussion. It is a distinguished honor for the Health Rights Clinic to be invited to speak. Newman stressed the extreme need for legal services for the underserved and impoverished patients at the health care sites they frequent. By operating out of facilities where patients go to regularly and being in a known environment with medical practitioners with whom they are familiar, patients are far more comfortable discussing legal needs and challenges they may be encountering. During the Grand Rounds, in addition to Newman, law students Zachary Lipshultz and Rebecca Greenfield discussed patients they are working with through the partnership. Lipschultz is in the process of securing coverage for a total hip arthroplasty for a 63-year-old undocumented indigent Hispanic woman and securing Medicaid coverage for a total hip replacement for a 54-year-old man. Greenfield discussed the cases of the 49-year-old Hispanic man in need of foot surgery but who is not yet eligible for Medicaid benefits, and a 41-year-old Hispanic man with HIV and in need of a liver transplant. He had been removed from the transplant list due to his ineligibility for Medicaid. By presenting at Grand Rounds, the Health Rights clinicians are providing the doctors and medical personnel with much needed tools to help their patients. In the United States, there are 429 people for every private lawyer but only one legal aid lawyer for every 6,415 impoverished person. In Miami-Dade county, the need is even greater due to higher numbers of immigrants, a high poverty index, and underserved populations of elderly. The Health Rights Clinic is a medical legal partnership operated in collaboration with the UM Miller School of Medicine. Students participating in the Health Rights Clinic represent multiple clients in different legal matters related to health. 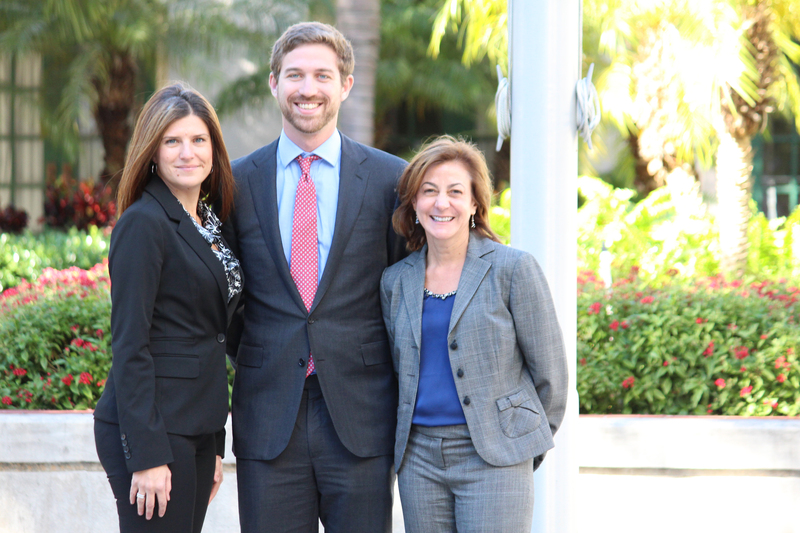 Under the guidance of Newman and Swain, clinic students spend the academic year representing low-income patients of the South Florida AIDS Network, Jackson Hospital and other medical partners. Law students function as the client's primary advocate and conduct client intakes/ interviews, conduct legal research, file legal pleadings and legal documents, develop case strategies and theories, and provide representation in administrative hearings and court. The Miller School of Medicine has collaborated with the Health Rights Clinic since 2005. The Clinic has served over 2,000 low-income clients and recovered over $2 million in benefits. More than 200 future lawyers have been trained in the public interest practice.